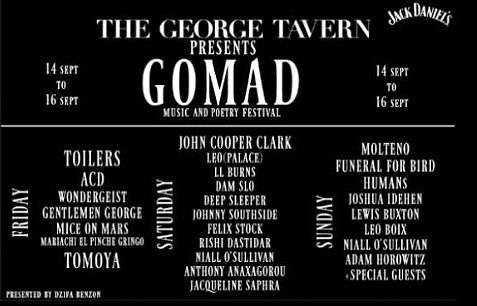 After more than 10 years of battling property developers who put our music license in jeopardy, The Save the George campaign has succeeded in retaining the right to continue featuring the best live music from the freshest talent. Here are some bios of who we've got so far: more poets, rockstars and DJ's to be announced ! Ticket prices + order of Line up also to be announced soon. DZIFA BENSON : multi-disciplinary live artist who uses literature as her primary mode of expression. The intersections between science, art, the body and ritual and by the question of who or what is invisible animate Dzifa's practice. She explores this through poetry, storytelling, theatre, performance, libretti, essay, journalism and a range of other media. She also embraces education, collaboration and participation at the heart of her practice. She is interested site-specific work as well as subverting the use of existing spaces. DAM-SLO are Wilf Peth & Ben Hauke. After a brief hiatus, in 2017 they were awarded a residency at the Islington Mill in Manchester. During this time the pair were able to refine and realise their live set. The product is an aggressive and often improvised melding of alternative hip-hop, house and jazz which guarantees to have a room dancing. A kind of atheist Christian rock band that are agnostic and don't play rock. Jess Molteno Murray creates atmospheric dream pop with flavours of folk and trip hop, MOLTENO is all about the elements, the moon and the stars. Her dreamy soundscapes start taking shape in her East London studio and are built up by her team to blend real with surreal. Yorkshire born, South London residing, garage post punk tying in themes of satire, insanity and rodent based raucousness. Deep sleeper are a post-industrial six piece band with immersive soundscapes and high energy performance. Blending new electronics with melodic guitar sounds. A project exploring indie folk, with elements of electronic music and other genres.